We took some photos with the size Large jacket on our Fit Check mannequin Shirley so you can take a look at our photos see what that looks like. Shirley is a standard dress size 12/Large with a 38” chest, 32” waist and 39” hip. 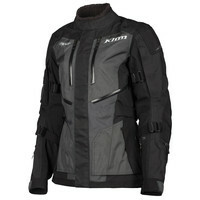 Klim’s Artemis jacket for women is a great choice for adventure riding. This jacket has a waterproof shell with Gore-Tex technology to make it waterproof. D3O armor is included. Yesterday I reviewed the Altitude pants and the Artemis pants together since I really didn’t find a substantial difference in the two styles. Both shared a pretty close feature list and “felt” about the same. Now that I look at the Altitude and Artemis jackets together, I see the design difference in the two. The Altitude jacket is a bit lighter in weight with lighter materials. It appears a bit more stylish to me with a more tapered profile and leather accents on the sleeves and elsewhere. It also has less hardware showing. The Artemis jacket looks more rugged and “feels” more heavy duty. It also has more zippers and pockets on the front profile. To me it just looks more “serious” overall and it is more squarely aimed at the adventure rider. It also has more size adjusters for the sleeves and waist. Every good adventure style jacket needs pockets and this jacket has PLENTY. All the exterior pockets have waterproof zippers to keep out water. On the front are four good size pockets, but there are also plenty others. On the back of the jacket is a large cargo pocket and on the left sleeve there is a small pocket on the bicep area and on the left pocket is the medical pocket found on most Klim jackets. Inside are to standard cargo pockets along with a pocket for your tunes. And there is also a “hidden” pocket on the back side of the back protector to stash stuff away from prying eyes. The zip vents are all “direct vent” meaning when the zips are open, air flows right through to your body (another advantage of the bonded Gore-Tex construction). This jacket has two large front vents just under the bust placed in the jacket on a slant, which looks nice. They’ll also be very effective. Sleeve end vents will flow air up the sleeves. The neck opening has little loops that will engage the molded plastic hooks you see on the front near your collarbone. Hook the loops to hold the collar tips back. This will get the collar out of your way when it is not raining and also gives you another point of air flow entry when its hot. This is a nice feature! I back are two large vertical vents to let air pass out of the shell. Klim says: Designed for full-spirited adventure, the Artemis is ready to travel the world, yet right at home for everyday riding. Engineered for women by women, the Artemis is purpose-built adventure for women.